3 Doors Down – 3 Doors Down are an excellent live band. I saw them in Manchester in 2012 and they were, well as I said earlier, excellent. Somehow they were missed off the honourable mentions list for my gigs of the year blog - definitely an oversight there. Anyway, they are a pretty strong booking for Download I think. They’ve never played the festival before and it’s always good to see a first time booking on the line-up – especially when it is a band as good as 3 Doors Down. Airbourne – Last time I caught Airbourne was the beginning of their set at Wacken 2011 (would have stayed for the whole thing but I was pretty damn tired). They are a great live band and they work really well at festivals. 2013 will be the 3rd time they play Download but it will be the first time I see them there, so I’m ok with this. Amon Amarth – Amon Amarth is another good booking for Download as far as I am concerned. First time they’ve played the festival since 2008. I enjoyed them when I saw them at Wacken last year. If they don’t clash with anyone I’d prefer to see at Download, I suspect I will watch them again. Asking Alexandria – This is a band that I just cannot get into. I’ve tried a couple of times and I have to say they are just not for me. 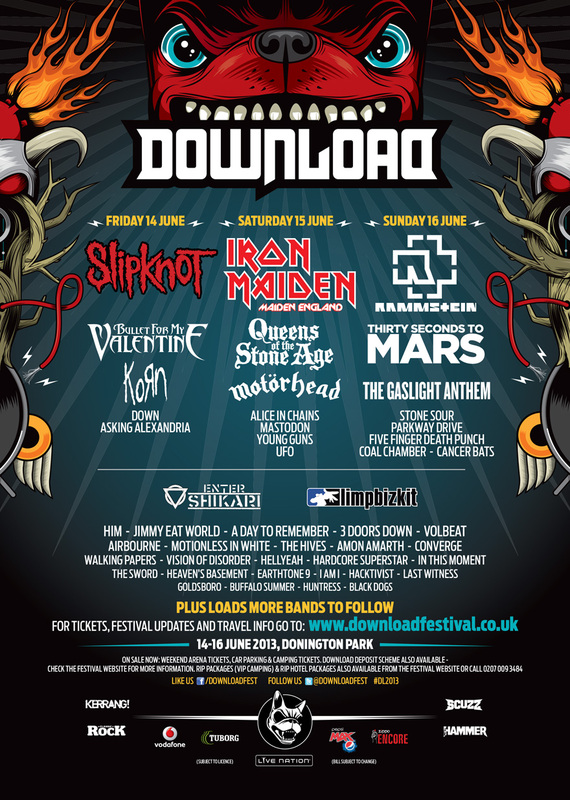 I could piss and moan about the fact that there is a band playing Download that I don’t like – or I could just...not. The only thing I will say which is mildly annoying is that between them and another announcement from today is a band I want to see. Again, it’s mildly annoying; it is not the end of the world. Black Dogs – I haven’t heard much of Black Dogs but what I have heard, I like. While typing this short paragraph, I am listening to a song called “Savages” which is ace. Also, their bio on their band camp page made me smile: “Black Dogs: an unstoppable pack of northern bastards”. Buffalo Summer – Can’t find much stuff by this band (one song so far) but that one song is pretty good so I am ok with this booking. Bullet For My Valentine – One of the bigger announcements from this batch. I have yet to see Bullet For My Valentine. It has only been recently I have actually got into them. As I haven’t seen them, I’m alright with them having been announced for the festival but I can fully understand why people are getting annoyed with how many times this band has played. They have played in 2004, 2005, 2006, 2008, 2010, 2011 and now 2013. Assuming nothing goes wrong before the 2013 festival, they will have played 7 out of 11 festivals. That is a lot. Coal Chamber – I don’t know a massive amount about Coal Chamber other than they are doing reunion shows and their front man is the Devildriver front man, Dez Fafara. I like what I’ve heard of them though so they could be worth watching. Converge – This is another band that is not for me. I’ve always meant to listen to them but never had until this announcement. Having now listened, I almost wish I hadn’t. I don’t hate them, but I can’t claim to like them. Down – Down is very hit and miss for me. Some of their stuff I really like but some of it, I really don’t. However, I’ve seen them live twice now and they are excellent live. They were one of my favourite bands when I went to Download for the day in 2011. I imagine I will watch them again, although they find themselves sandwiched in-between two bands I won’t be watching. Earthtone9 – This is a band I first became aware of in 2010 (late to the party as ever) and really liked what I heard. They were announced for Sonisphere and as I was headed there, I planned to watch them. Then the stage times came out and they clashed with Motley Crue. Based on how Motley Crue was that day. I really wish I’d gone to see Earthtone9. Again, if there is not a clash I will go and see Earthtone9. The song Evil Crawling I is a beast of a tune. Enter Shikari – I’ve added some of their music to my Download Festival 2013 Spotify playlist because I don’t mind some of their stuff. However, on the whole, I cannot get into Enter Shikari, and I doubt I’ll be watching them. Maybe watching them will help me get into them? Who knows? If they clash with no-one else I want to see, I might give them a chance. Five Finger Death Punch – This is a band that I wouldn’t mind watching live. I haven’t seen them before (although the opportunity hasn’t come up). They were booked for 2012 but had to cancel. I’m not a massive fan of their music but I like what I’ve heard so they could be worth watching. Goldsboro – There once was a pop group called Orson. They had a bit of success in the UK with their debut album but the second album wasn’t so successful and they split up. The reaction to all of this is Goldsboro – a rock band that Classic Rock magazine suggested were “a power trio pitched somewhere between Judas Priest, Thin Lizzy and Black Sabbath”. Having listened to some of their music, I can agree that it is very good. They could be well worth watching. Hacktivist – I can’t make my mind up about Hacktivist. I’ve listened to them a few times now and I go between liking them and not. I guess this is what is known as the struggle to get into a band. I recognise they are a decent band but I can’t decide if they are to my tastes or not. Heaven’s Basement – I last saw this band supporting Halestorm and they were very enjoyable. They’ve played quite a few of the UK festivals I’ve been to I think, and I’ve never managed to watch them at a festival. They tend to clash with other bands I’d prefer to see. I might watch them at Download, might not – we shall see. HellYeah – I saw this band at Download 2007 and remember thinking they were quite dull. It was cool for me to see Vinnie Paul behind the drum kit (after the death of Dimebag Darrel, I never thought I would see that) but that didn’t help me through the whole set. Since 2007, they have released 2 albums and I’ve listened to some of the music from them and I am tempted to give them another chance. Huntress – After their announcement, I thought “I’ve heard of that name before”. Turns out the reason I had heard of it as it is a recruitment agency. I found the band shortly after that realisation and came to another one – Huntress are ace! I’ll definitely be trying to see them. Only heard a handful of songs but from what I’ve heard, they sound excellent. I AM I – In 2010, ZP Theart left Dragonforce in what I seem to recall was quite a shocking move. I AM I is the band he formed following his departure from Dragonforce. It reminds me of a power metal vibe but in a very different way to Dragonforce. They are a fairly decent band though and a good booking for Download. I more I listen to them; the more I am reminded of Edguy actually (without Tobi doing the vocals). In This Moment – I’ve seen In This Moment before when they supported Devildriver on their pre-Download 2007 gig. That was a good night actually. I remember that I really enjoyed In This Moment and have wanted to see them again. The chance has not come up sadly. If they aren’t clashing with anyone then I hope to see them at Download. Jimmy Eat World – I saw Jimmy Eat World twice in 2011 and thought they were good both times. I preferred them when they supported Foo Fighters as they played the songs I knew mixed throughout the set, as opposed to playing them right at the end of the set like they did at Reading. Anyway, I am really happy about this booking as I do like what I’ve heard of them. If I end up planning to watch them though, I’ll do a little more research first. Last Witness – I listened to some of Last Witness earlier when prepping for this writing and they didn’t do a great deal for me. That’s pretty much it. I don’t hate them, or even dislike them. I just don’t care for them really. Limp Bizkit – What can I say? Limp Bizkit, along with Linkin Park got me into rock and metal music. For that, they will always have a special place in my heart (a place which Linkin Park are doing their best to leave but that is a sentiment for another blog, maybe). I saw them at Sonisphere 2009 and thought they were alright. I remember thinking that they could have been better. I didn’t see them at Sonisphere 2011 as they clashed with a couple of smaller bands I wanted to see. However, I think I would like to see them again. The thing about their positioning is interesting as it appears they are headlining the second stage on the Saturday. This means, due to an agreement between the festival organisers that they will clash with the end of Queens of the Stone Age’s set, and the changeover gap before Iron Maiden. I am tempted to go and watch them and when they are finished, try and get as far forward as possible for Iron Maiden. That sounds like a good plan – I shall see what happens when stage times are released. Mastodon – Mastodon have released one song that I like. I’ve tried so many times to get into them and every time it ends in failure. I guess it’s just not meant to be. Motionless In White – I haven’t listened to much Motionless in White but what I have heard, I have quite liked. A fairly good booking I would say. Parkway Drive – Pretty sure these guys have played Sonisphere before when I’ve been there and I’ve missed them. Listening back to their music now, I can see why I missed them. I like what I am hearing but I am not in love with it. In terms of them being a festival band, they definitely fall into the category of “if there’s nothing else on I fancy watching, then I’ll watch them”. 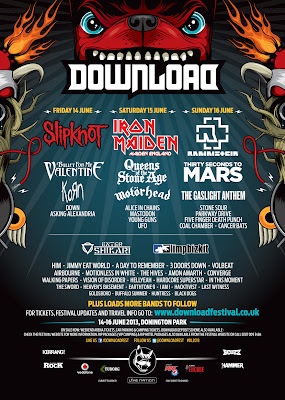 Stone Sour – Stone Sour are one of my favourite bands so I am of course delighted to see them on the Download line up. I wish they were higher up but no matter! I suspect I’ll be watching them. The Hives – This is a very surprising booking for the festival I would say but I am really happy with it personally. I love the song “Hate To Say I Told You So” and I’ve been told they are a superb live band. I imagine I will be watching them as long as they don’t clash with one of my must-sees of the festival. The Sword – I saw them live in Portsmouth off the back of the song they had on Guitar Hero and I ended up leaving quite early. They were pretty boring that night. Some people love them; I am not one of those people. UFO – Nothing wrong with a bit of classic rock early in the day to get things started. I bet some of the music would be good for a sing-along. It would be outstanding if they performed Doctor Doctor live before Iron Maiden came out on stage, but I suspect that is unlikely. Their set should be fun though, and it saves me spending £25 to see them in Portsmouth! Vision Of Disorder – I really like what I’ve heard of this band, which admittedly isn’t much (seems to be a theme of these blogs). I would like to see this band at Download if I get the chance. Walking Papers – One more blues rock band on the line up is no bad thing. I like some of the music I have heard from this band. I was surprised to learn that it is Duff McKagan on bass. I wonder if he is a live member as well. Anyway, they are another band that I will see if I get the chance to. Young Guns – I like some of this bands stuff. I also don’t like some of it. Will I watch them? Who knows? Only me, and I don’t at this stage. If there is nothing else on, then I probably will give Young Guns a watch. All in all, that looks pretty good. At the end of my last announcement blog, I posted a list of bands I suspected would be announced. Of the 10 I listed, 6 were announced. If you look at the poster, it is fairly clear that there are still 2 second stager headliner slots to fill. I think they will be filled by Paramore and The Scorpions. There is no science behind that guess. Scorpions have been rumoured on various websites for a short while now, and Paramore are playing other European festivals at around the same time as Download. As for other bands, I would like to see The Wildhearts get announced although I suspect at this stage they might not be. I would still like to see Bad Religion get announced as I was really looking forward to seeing them at Sonisphere, and then they clashed with Panic Cell’s last ever show. I think I’d like to see Within Temptation get announced but aside from that, I can’t really think of any other realistic names I’d like to see added to the bill. That’s an odd way to be with about 5 months to go before the festival, but the current line-up in my opinion is pretty strong. EDIT 2 - It would seem that The Hives are clashing with Iron Maiden. That is really not friendly. I said I would watch them as long as they are not clashing with one of my "must see" bands. Iron Maiden are a must see band. Bah!